An Airius Destratification system correctly installed can give savings in heating bills of between 25% and 50% per year. We have a ceiling mounted unit in our Showroom which demonstrates the temperature difference between ceiling and floor. This can be compared to the difference in temperature in another area where it has not been installed. Floor to ceiling differences with the fan can be as low as 1 degree centigrade compared to 10 degrees centigrade, demonstrating the huge saving in energy that is gained by putting heat where it is needed: on the floor rather than heating the pigeons on the roof! Recently, we installed a number of Airius Destratification Fans at Graphic Art, Cambridge. This helped bring heat from the high ceiling to the staff in the production are area making the working environment much more pleasant and saving energy. The Carbon Trust approved a loan for the implementation of this simple energy saving exercise. The Airius Destratification ceiling fans are the most efficient destratification products available. Our cost effective products work alongside your existing HVAC systems. 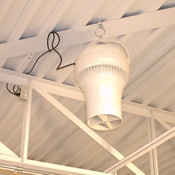 Easy to install, simple to maintain and economical to operate. We have models that accommodate nearly any working environment temperature control. Our units are appropriate for ceiling heights from 10 to 75 feet, adaptable to changing floor plans and are designed to service up to 2500 square feet each. The Airius Destratification free hanging ceiling fan is an extremely efficient wind turbine that is suspended just below ceiling height. Each fan takes in the hot ceiling air and transports it to the floor below in a slow moving column of air to create a better working environment and reduce total energy consumption. Each free hanging Airius Destratification Ceiling Fan is capable of equalizing up to 2500 square feet of floor area. Sports Halls, Warehouses, Retail Outlets, Factories, Show Rooms, Theatres, Hospitals, Meeting Rooms, Libraries, Exhibition Halls, Prison Facilities, Leisure Centers, Concert Halls.